Rock climbing is one of the most popular and scintillating sports activities today. Anyone who loves a bit of adventure and thrill should give rock climbing a try. As a matter of fact, there are several institutes and organizations that offer courses in rock climbing. You become eligible to venture out alone only when you complete such courses. After you finish it, a certificate is awarded. To create this certificate, you should take the help of the templates below. You can also see the Certificate Template. 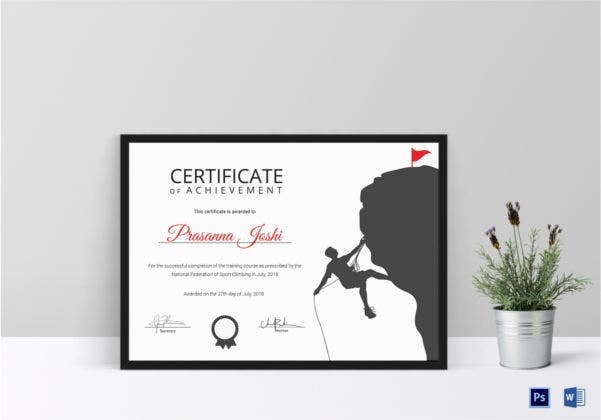 This rock climbing certificate consists of a thick black border with blue designs on the side. Also, it is compatible with word and that makes it very easy to use as well. This rock climbing certification would be apt as a participation certificate being awarded to someone who has taken part in a competition or rock climbing activity. It is fully editable. 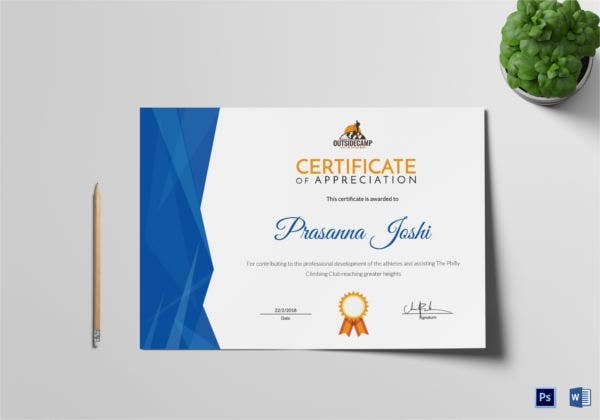 This template consists of an attractive design and a silhouette design which makes the certificate template look all the more attractive. 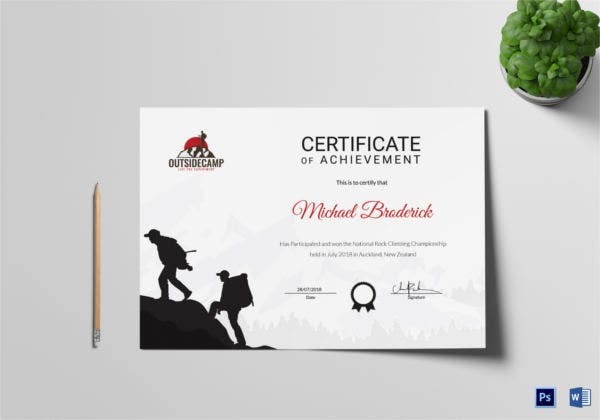 This rock climbing certificate template is fully editable as well. 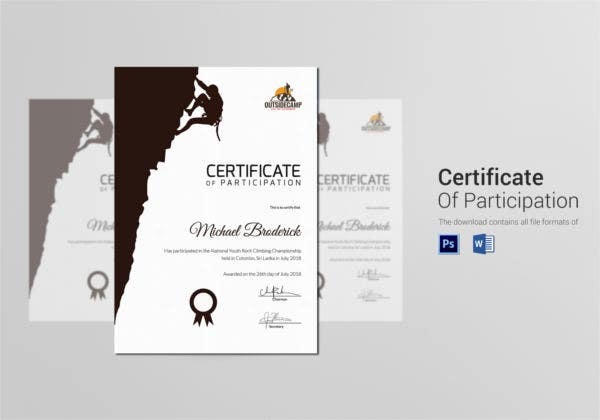 This certificate template would be perfect for a certificate of excellence in rock climbing. You can download the rock climbing template and then edit the minute details present on it. 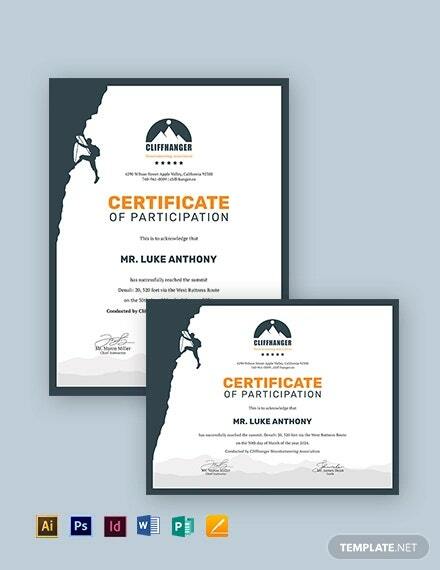 This certificate template can be awarded to students who have completed sufficient training in rock climbing. You can download this beautiful certificate template and then personalise it as you please. > Who can use the Rock Climbing Certificates? Rock climbing being a kind of specialised activity requires sufficient training before you can venture out on your own. Once you complete this course, you will be a certified rock climber. To establish that, you would be avoided a certificate of training. Now organisations and institutions who offer such courses can use these certificate templates for their courses. As a matter of fact, certificates of excellence may also be avoided to exceptional students. For that, these templates may be used as well. These certificate templates are thus versatile and not to mention, multipurpose and can be used in a variety of ways. > What do the Rock Climbing Certificates Contain? 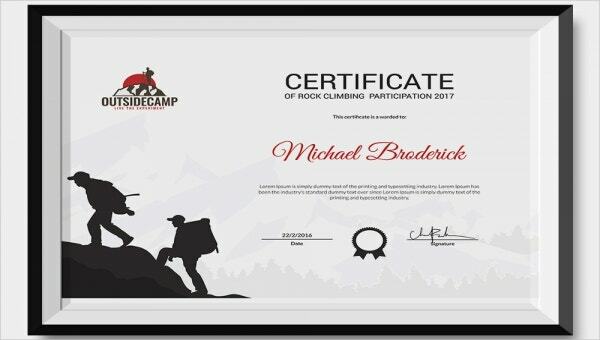 The rock climbing certificates contain what any other certificate would consist of; however, they are much more specialized. For instance, this certificate usually contains a prominent border and most of the certificates contain silhouette designs. One look at the designs would tell you what the certificate is all about. Plus, they contain a heading as well. Next, you have the certification which would contain the name of the person receiving the certificate. 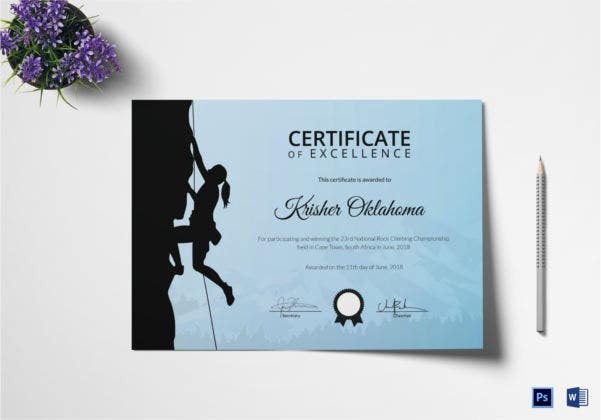 These rock climbing certificates are sure to come in handy if you are awarding certificates on a mass scale. All you have to do is select the certificate template you like, download it, make changes if necessary and print them. This will certainly reduce your hassle to a great extent.